Mantic | Azazel's Bitz Box. Stop here. 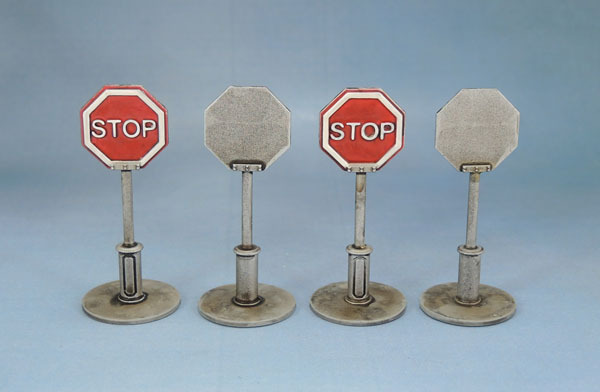 Sit and rest awhile – Mantic’s Mars Attacks Stop Signs and Benches. A bit over a year ago I busted open my Mars Attacks Accessory sets, and got to (slowly) working on the contents (occasionally). So far, I’ve finished the incredibly unimpressive result of 8 box stacks, from the four sets I had. Recently, I’ve finished a few other bits and pieces. Namely, the STOP signs, and the benches. You can’t really tell here, but there’s a subtle metallic as part of the red and I tried out Warcolours Metallic White on the white sections. I did this to emulate the reflective qualities of real STOP signs, at least those located in Melbourne, where I live. I initially tried the metallic white over silver but it worked poorly, so I repainted the details in white, and then went over with the Metallic White. Even in-hand, the metallic effect needs to be pointed out with an “oh yeah, now I see it” result. A kinda generic grungy grey for the bases. 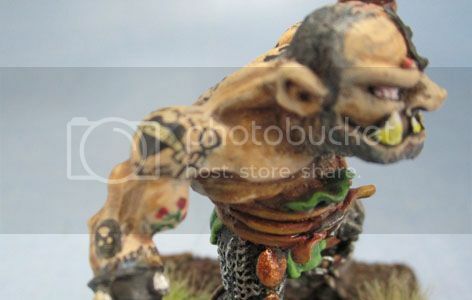 Mars Attacks Accessory Pic from Iron Saint’s Children of the Kraken Blog – go visit! I’m recycling this pic from the post about boxes again, to show the contents of the full sets, along with just how little I’ve actually gotten done so far. I have the rubbish bins and mailboxes sitting in a little container, sprayed silver. I wanted to salt-weather them, but haven’t gotten around to it yet, and at this rate it’ll be a long wait until next summer before I get off my arse and get them done. I want to do a similar thing with the picket fences. In my mind’s eye, they’re dirty white, with the paint peeling off (salt weathering) to reveal stained grey wood underneath. These boxes are not on the hillside, nor are they made of ticky-tacky, but they are (almost) all the same. Ok, this is a scenery post, and a simple one at that, as it deals with a few pieces of minor scatter terrain. A long time ago, I backed Mantic’s Mars Attacks Kickstarter, and amongst all of the stuff that I received (and still haven’t used.. shhh!) 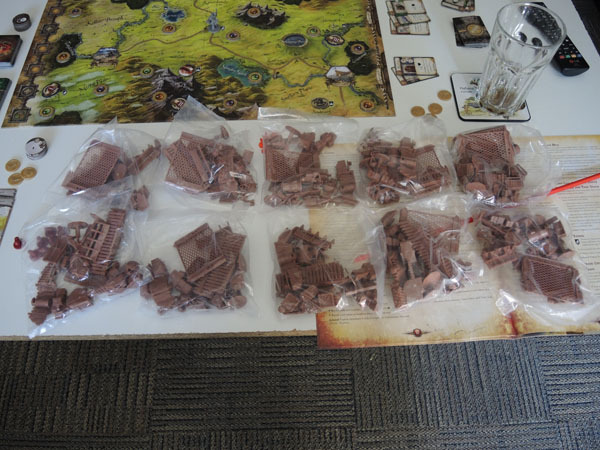 was a few sets of the scenery accessories. Naturally, I forgot to take a photo of the Accessory pieces before I started on any of this stuff, and Mantic’s photos don’t show them very well. It is in fact a very good gaming set. It turns out that I had four of them. Unless I find another 1 or 2 in boxes someday. I actually started painting the post boxes and rubbish bins back in summer, about 9 months ago, but managed to mess up the salt weathering. So the whole project went into limbo. A few days ago I spotted the box-barricades sitting on my painting desk and so decided to clean them up in a vaguely useful way – by painting them! All 4 sides of Mantic’s Mars Attacks box stacks. I also found a couple of resin crates that had been bought in the 90’s and sitting around part-painted for years, and spent the whole of 10 minutes that it took to finish them as well. I have the attention span of a flea, sometimes… I think they’re probably originally from some set by Grendel/Scotia Grendel, since that’s where most of my really old resin junk originates from. Finally, some Zombipocalypse survivors, Space Marines and Dwarves help out with showing the scale and how they fit in decently well with all three disparate types of model. They’re a little on the small side, and while they’ll work well as meeples for barricades in games of Zombicide, they feel a little like those annoying foot-high “walls” that videogames use to keep our otherwise athletic heroes from straying outside of the designated play area… They might work better stacks on top of other items to create useful cover, but even as is they make for decent ground clutter. 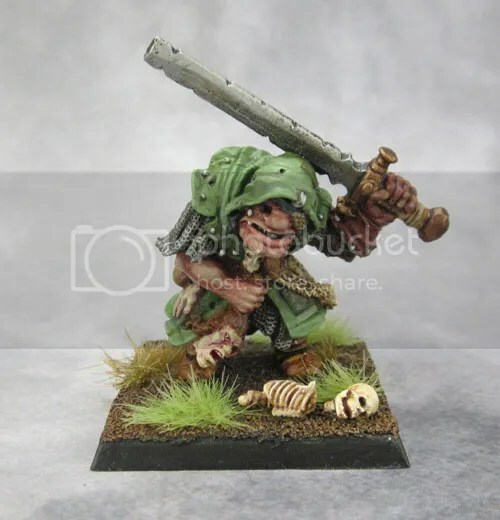 As I said, this guy had been part-painted and in a minis case for some amount of time probably approaching 20 years – sometime around when the others were started and the initial ones were painted, in any case. I’ve kept as much of the original paint I started with him and worked on the rest. Still, I had one hell of a mental block to overcome in order to finish him. 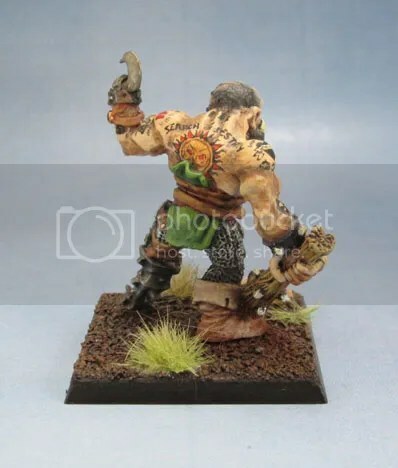 Rear view of Gutlagg – showing his tattoos. Gutlagg here was basically finished years ago. I may have even shown him off on these pages before, but now his unit is finished, and he’s been promoted to the unit leader. So hey! This guy has a name, but he’s usually just referred to as “Ogre Thug”. There are two versions of this guy with just a small variation between them. This one has a small pouch attached to his chest, while the other has a small armoured disc. Since I somehow ended up with three of this guy, including both variants, I ended up converting two of them. One can be seen here, with the original mace head replaced by a hammer head and the spike on his helmet removed. The guy showcased on this page was originally painted in an embarrassingly garish scheme. (Yes, how he appears here is heavily toned down). His weapon mod was also embarrassingly bad. So bad in fact that I don’t think I took any photos of him at all before reworking him. 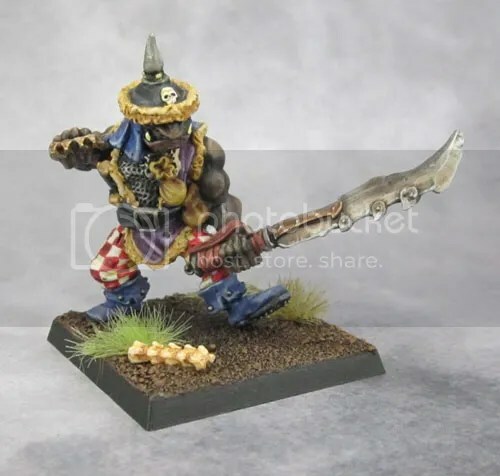 His mace head had been replaced with an Advanced HeroQuest (Or Dark World? Something like that, anyway) Ogre’s Big ugly tree-club with a spike added to it. It looked awful. I ended up adding a Mantic Ogre’s 2-hander blade to it, and it looks roughly a million times better now. 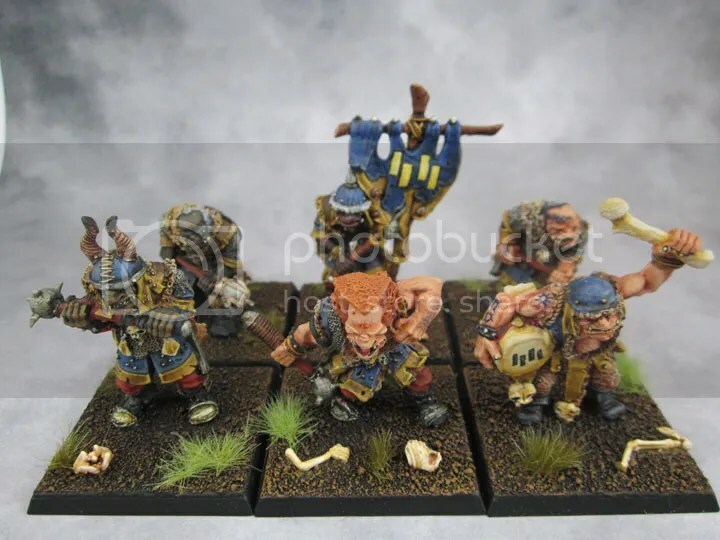 C23 Ogres in a Kings of War regiment. 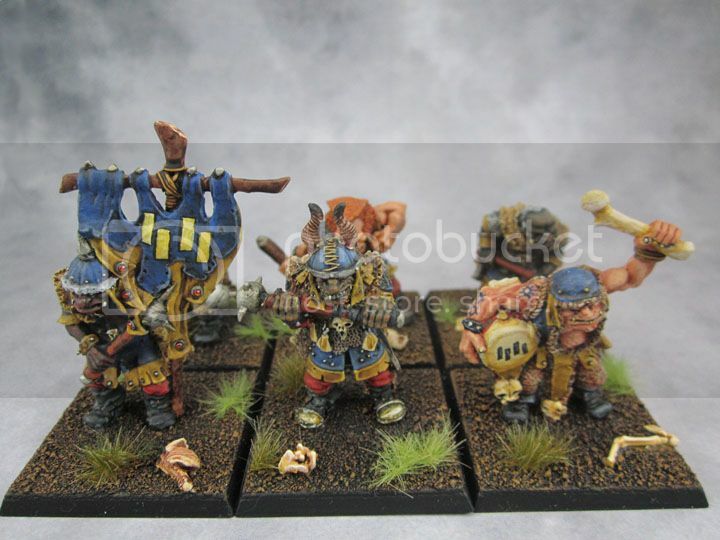 Here’s the final, completed unit of these Ogres. I’m getting down to the last few of these old models now to paint and finish, which is both heartening and also a little sad. 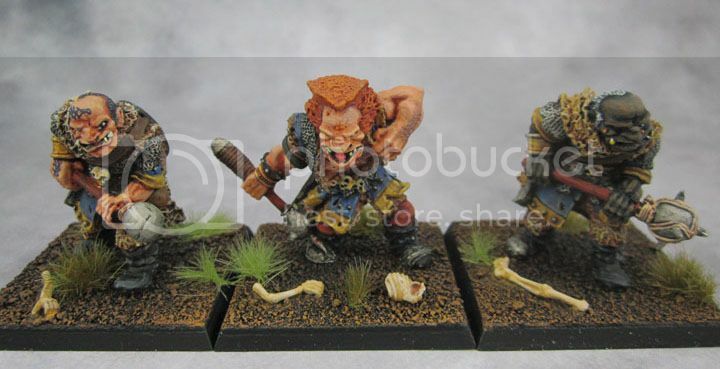 Jes Goodwin Classic Citadel Ogres #2 – Berserkers! Mantic’s Ogre Shooters: Units 3 and 4. 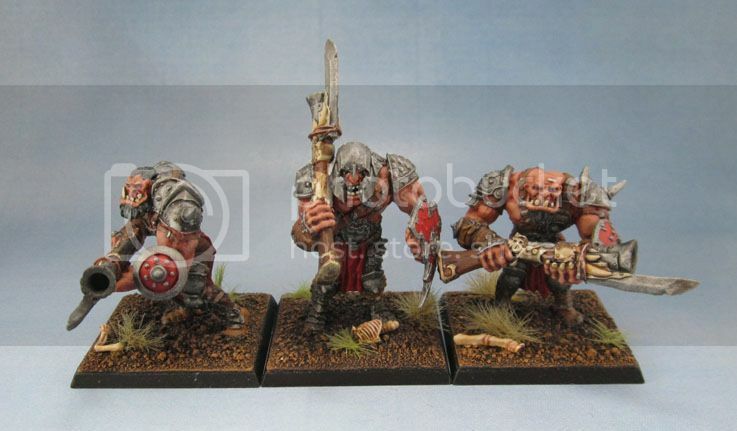 Classic C23 Citadel Ogres for Kings of War – Unit 2: Ogre Berserkers! 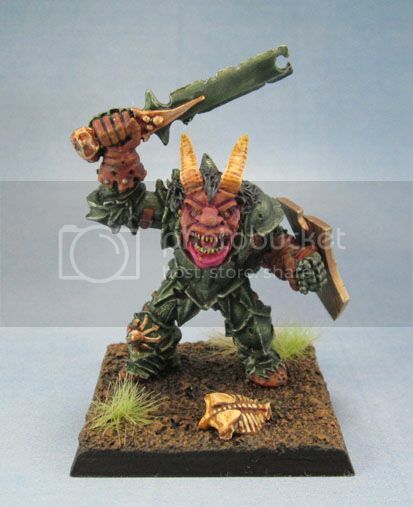 Another of the figures that I’ve just finished this week after initially being started years ago, restarted a couple of years ago, and re-restarted several months ago – the C32 Chaos Ogre from the mid 1980s. 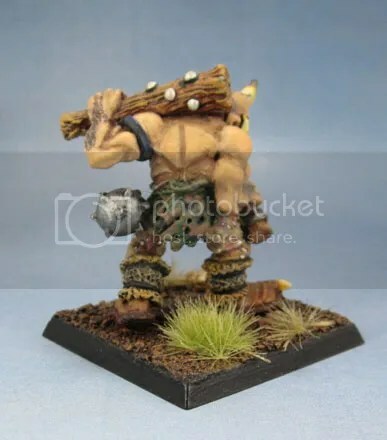 He nicely provided the final figure in another unit of three – my Berserkers. I think I may have originally been planning to use him as one of my two single-Ogre units – since he looks like the kind of complete nutjob that Ogres might allow to fight alongside them, but, you know, don’t get too close to me – but since they’ll be removed as an option in the new edition of Kings of War, I’ve just dropped him onto the Base with the other two C23 Ogres that I’m using as Berserkers for now. C23 “Chaos Ogre”. See what I mean about looking like a nutjob? It took awhile to work out a skintone that would work well with the armour. The ruddy tones for his face and horrid pink and purple for his lower jaw seem to provide enough contrast without looking too garish. 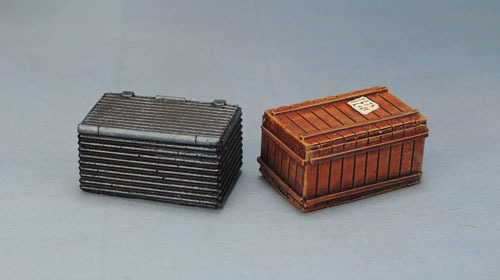 Red-browns for his leathergoods, and bronze for the metal trim again provide enough contrast without overwhelming the model or making it too busy. As you can see, I decided to go with a Nurgle-themed look to him in the end, though not so completely over the top as so many of the current models. 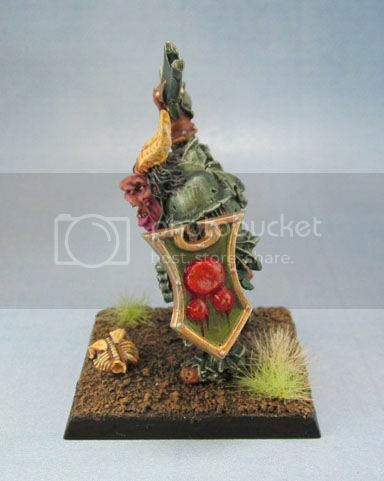 A green tinge to his beaten-up and damaged armour, and some glistening, oozing pustules on his shield were enough to match the model’s aesthetic. He’s much more “Chaos Warrior” than “Chaos Spawn”, after all. C23 “Chaos Ogre” …I see you baby. Unsurprisingly, the rear of the model is the least interesting side. Armour plates are as armour plates do, after all. I used brass/bronze chain to break up the endless green a little. C23 “Ogre Berserker” How appropriate! I really thought I’d shown off the other two, but I can’t find them in my archives, so here goes. These guys were both painted a long time ago in the early 1990’s. Last year I cleaned them up a little while maintaining as much of the original work as possible. In practice this really just came down to smoothing the blends in their flesh and brightening up things like metal that had become dull, rather than any kind of major repaints. 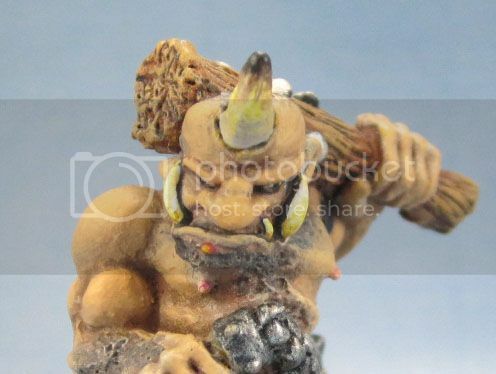 This guy was (is) actually called “Ogre Berserker”, so how appropriate for his current role in my collection. 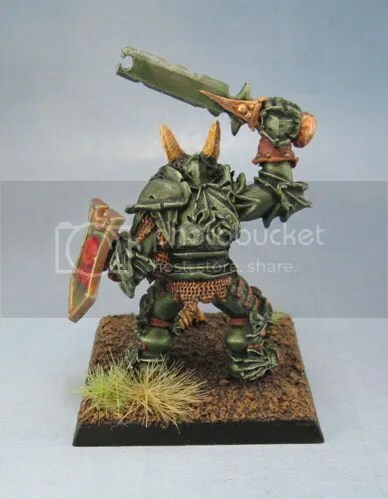 The mono-horn predates the whole Nurgle aspect by several years, but I admit does fit in thematically with his fellow here. I’ve got some “proper” Forge World Chaos Ogres somewhere, but their time will come later on down the line. I want to finish all of my old-school Ogre models before starting on newer ones like those. C23 “Ogre Berserker” Rear view. Nothing special on his rear view, though you can tell that he was painted in the same general timeframe as the Dark Angels Scouts I posted the other day as his pants are in “choc chip” desert camo and his loincloth in woodland. 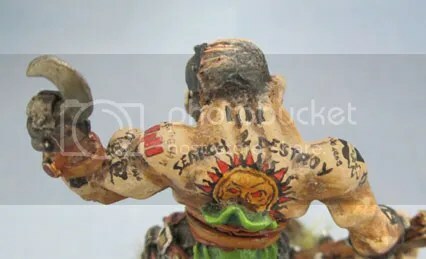 I think this might have been the figure that inspired me to paint my Marine Scouts in Desert Storm camouflage. 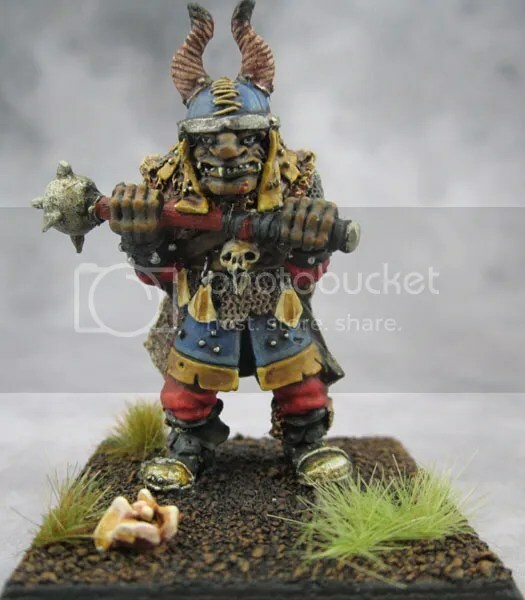 C23 “Ogre Berserker” – a nasty glare! 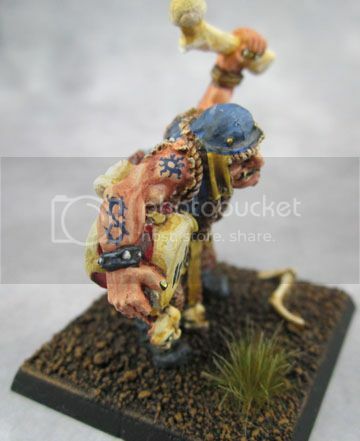 I’ve got to say – I really love the mean expressions and character that Jes Goodwin put into these Ogres. I’m pretty sure I’ve said it before, and I’m sure it won’t be the last time, either! 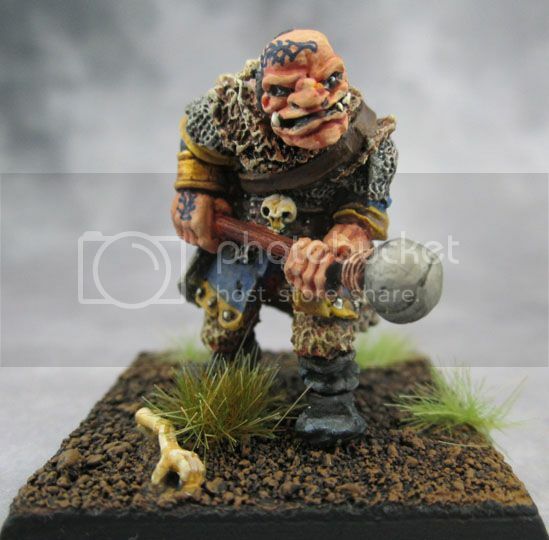 This next Ogre has clearly seen better days. With a peg leg, an eyepatch and a hook-hand, he’s got the pirate battle-wound triptych down. All he needs is a parrot and a tricorne hat (or bandanna) to complete the look completely into self-parody. SA clear forerunner and inspiration for many of the Maneaters that came decades later (as are many of the Original Ogres). This particular figure is quite special to me, for reasons you’re about to see. There’s a nice glimpse of it. When I painted this one, it must have been 1991 or 1992, and I was working in the fringes of the music industry, taking home a lot of CDs each week. Yeah, once I finished the skin on this guy, I just started painting Henry Rollins’ tattoos onto him. Not planned or anything, it just happened. If I’d planned it, I would have chosen a much more suitable figure to be the canvas for it, with a fully-exposed back, visible forearms, etc. Maybe even exposed legs. I’m planning to do another Ogre in the semi-near future with Rollins’ tattoos on him, and do a better job. 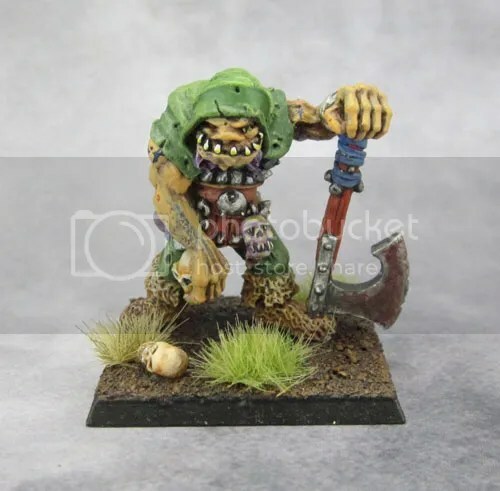 But for work that’s more than 20 years old, this guy still stands the test of time for me and remains one of my special favourites from all of my painted models. 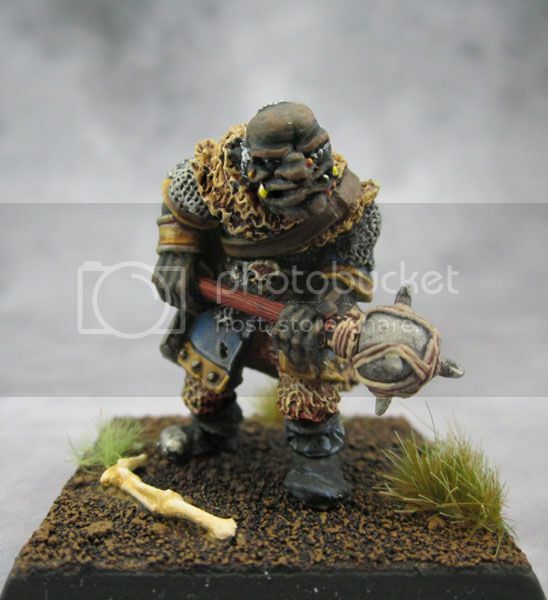 C23 Ogres – Berserker Unit! 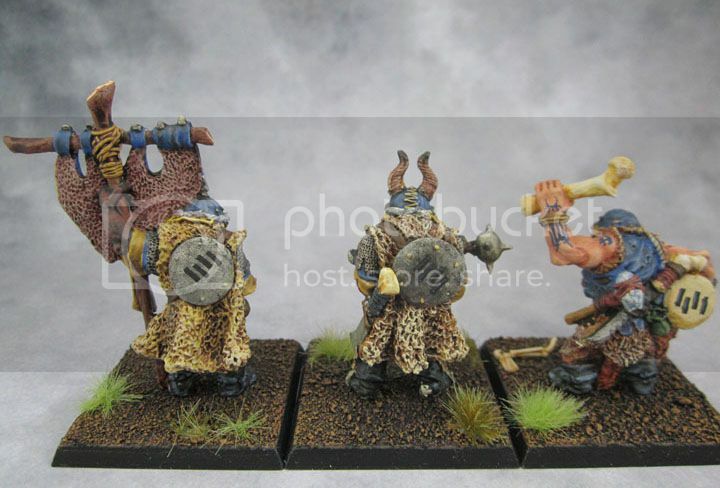 C23 Ogre Berserkers – The side of them you’d rather see. Despite the difference in dates, it’s “only” 14 months since I last updated on these figures. 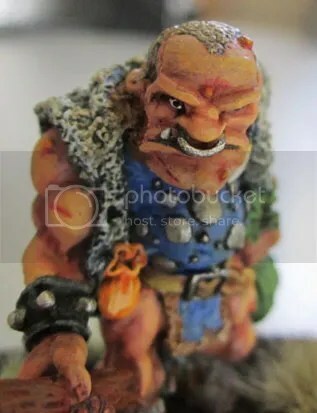 As I’ve noted before, while Mantic’s Ogre models do turn out nice enough, I do not enjoy painting them. My cunning plan was to cockblock myself and not allow myself to paint the “fun” Ogre models until after I finished the second batch of shooters. Since I hadn’t worked on them in 13 months, I think we can safely state that particular plan wasn’t the best. It was one of those 3am epiphany-type things that actually got me to finish these. Getting back into painting again after almost 3 months, wanting to paint Greeks and Romans, and thinking about the mess on the desk resulted in the thought of “just finish the fricking things – they’ll probably only take a couple of hours to finish” replacing the usual “shove them out of the way”. 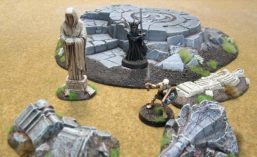 It’s the same thought process that helped get those Skeletons out of the way as well as a several of the other odd figures that I’ve recently shown and will continue to show shortly, and will also have some Elites for my Gondor army finished and off my desk in a couple of days. Or within a week. Or two. Hopefully. 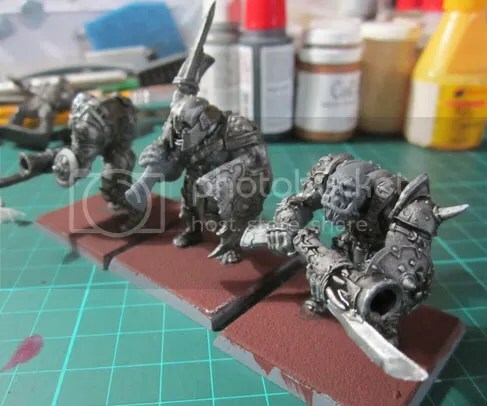 Mantic KoW Ogre Crossbows. Leader with Citadel head. I went with red tabards for these guys, so they’re distinct from the blue of the original two units, though sometimes they’ll potentially be combined into regiments of 6 rather than troops of 3. I’ve kept the tabards a dull red. I feel there’s no need for them to be overly highlighted. I’d been looking at the shields for months thinking about adding some red to them, and I think it’s worked well to add a little more colour and interest to them. 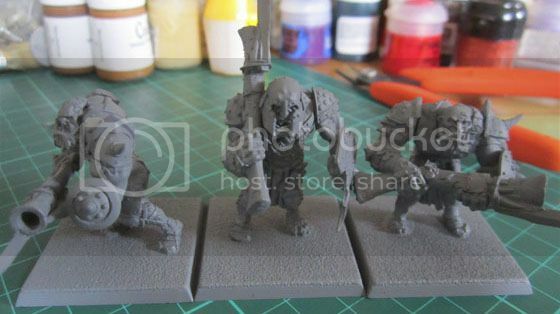 As I mentioned a long time ago, I used Citadel Ogre Kingdom heads on the leaders of both units since Mantic has an incredibly limiting six total heads for their ogres – most of which are average or below quality. (Along with only three body types!) The Crossbows are equipped with the “Jar of the Four Winds”, which I’ve represented by cracked amphorae filled with lemon-lime soft drink-coloured …liquid. 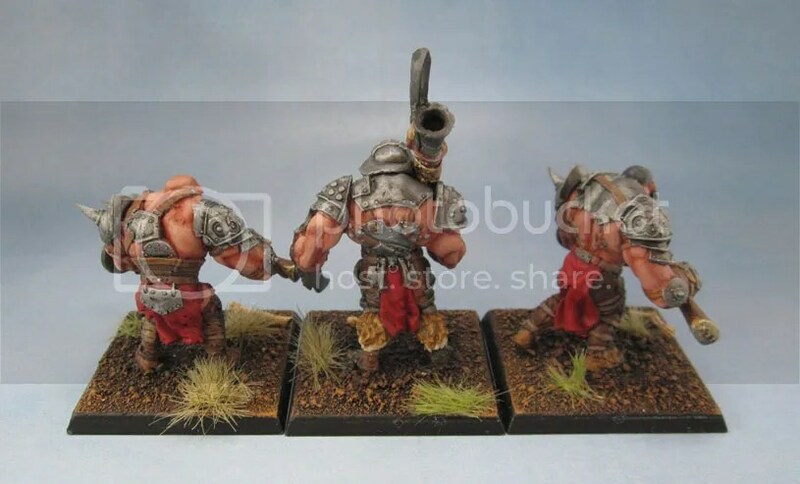 Mantic Kings of War Ogre Blunderbuss Troops. 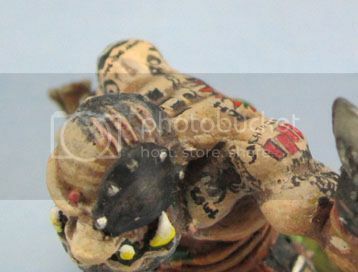 Again, the leader has a Citadel Ogre head. The blunderbuss unit had a bit more reposing, in an attempt to make them a little more interesting (or less uninteresting?) I also gave them bucklers and a shield on the boss to aid in this. It wasn’t until the end of painting them that I finally decided on painting the shields red. I’d hoped to finish all six of these in a week from getting “motivated”, but in the end it took closer to two weeks to finish the Crossbows and a further month to finish the Blunderbusses, but that’s largely due to the fact that I still found it quite hard to make myself sit down and finish them. I found breaking them up into their sub-units just made it easier again. The trouble being, obviously, that I didn’t really enjoy working on them. Now they’re done, I’m happy enough with them to use them or look at them, but I’m in no rush to work on more of them. 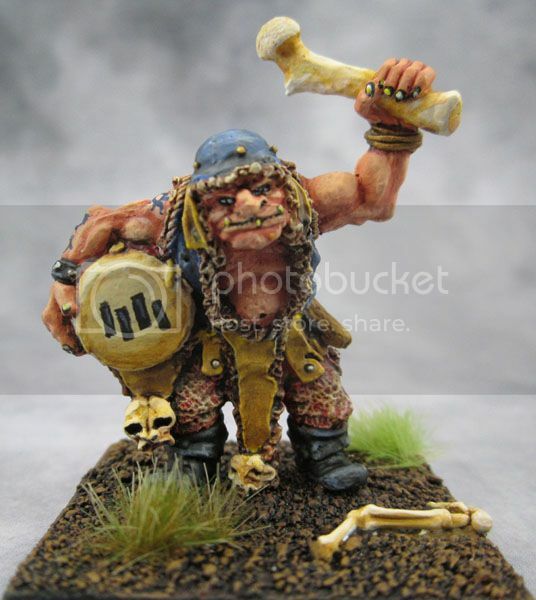 I’m planning on getting back into painting more interesting and fun Ogres – not Mantic ones for awhile! 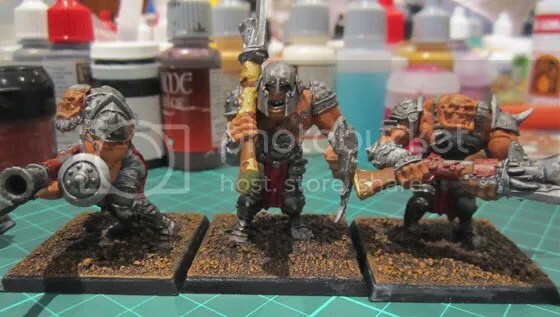 I’ve actually got two more units almost done – each both lacking a single Ogre to finish them. The Ogre Battle Line …so far. 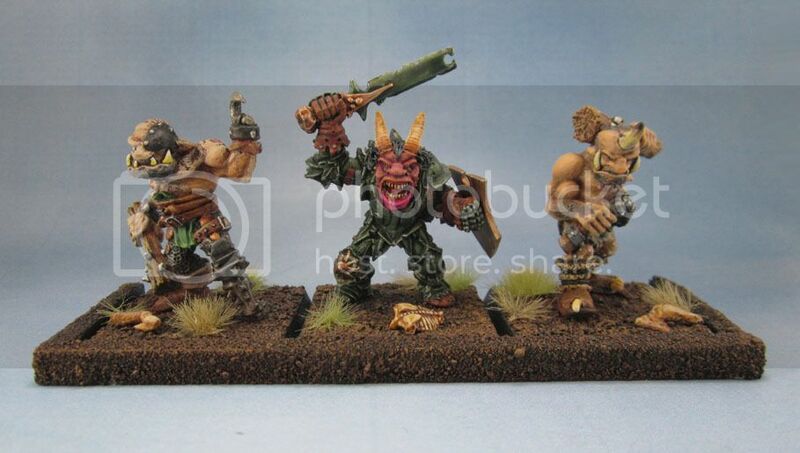 These are the second series of Golfag’s Ogres aka Golfag’s Regiment of Ogre Mercenaries. I picked these up when they were reissued sometime in the late 1990s with many of the other Regiments of Renown in the clear hard plastic sliding-back containers. (And I’m still spewing that I didn’t get the cultists!) 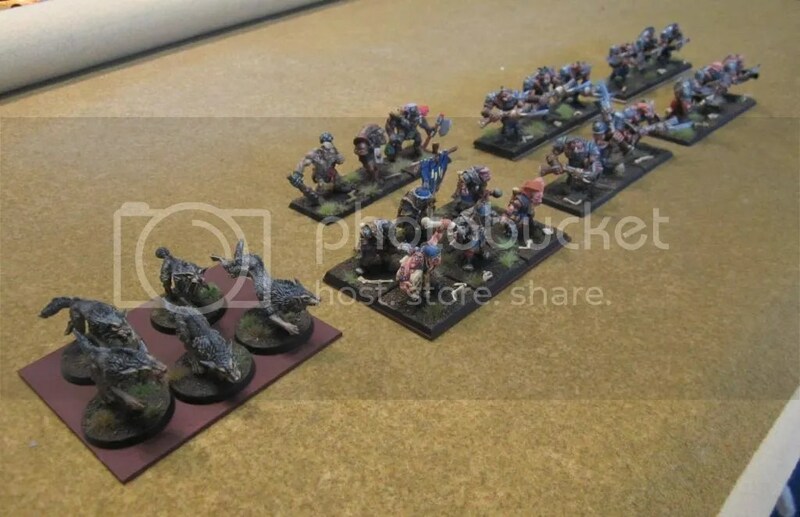 At the time I was collecting Ogres, and so this set was a natural, despite the higher than usual price. The set I got had 8 Ogres in it, but since the grunts were pretty weedy compared to even the current figures of that time (about the size of an Orc) and I wanted each of my ogres to be an individual model (which I still like the idea of today) I modified the mace of one (cut off the spikes and bindings) painted them with different skin tones and traded away the extras. It took me awhile to get around to actually painting them, since I decided that I didn’t like the sculpting style of these nearly as much as Jes Goodwin’s Ogres – epitomised to my eye by figures like Hrothyogg, Ogre Captain, “Ogre Thug” and of course, Skrag the Slaughterer. A now-obvious descendant of Golfag’s boys. Look at that mug! 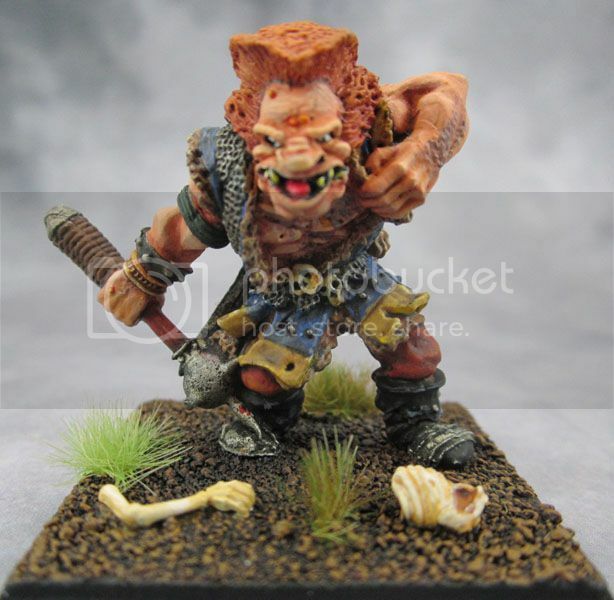 It actually wasn’t until I was cropping the pictures of these models a few days ago when something clicked – their facial features are so very similar to another of my classic Jes Ogres – one that I really like, in fact. 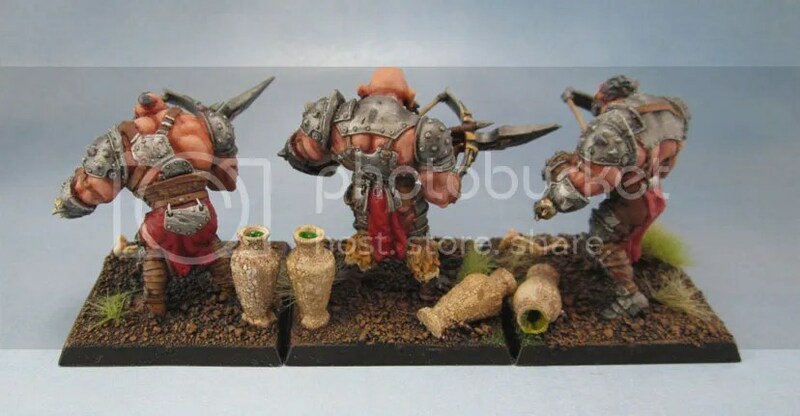 5 minutes on the web and I confirmed that this round of Golfags’ Ogres were indeed sculpted by Jes. DERP! Golfag’s Champion flanked by two nameless grunts. 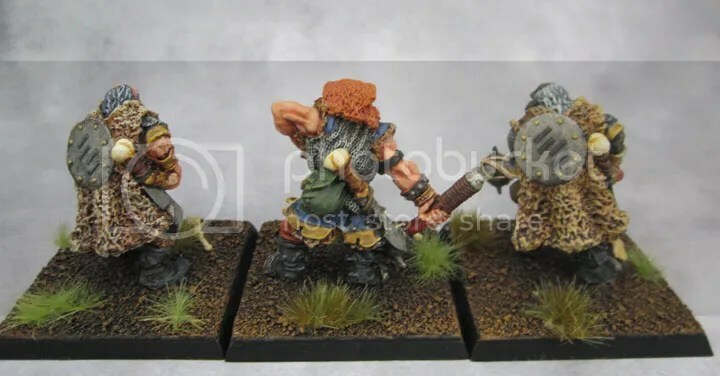 These guys, as my least-favourite ogre models had actually sat around in the bottom shelf of my glass cabinet, with no real priority to update them. 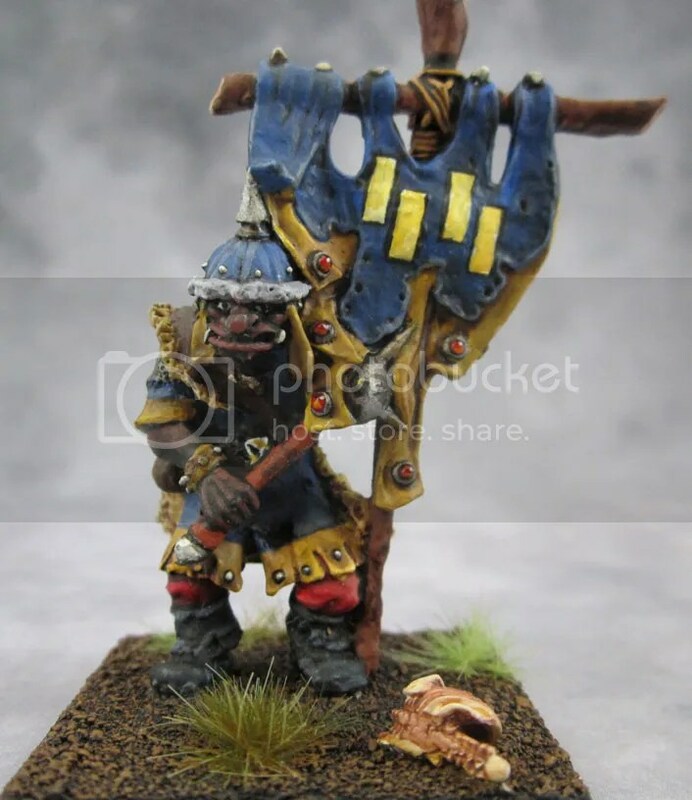 The standard bearer had been pried off his base to be blu-tacked to a chariot for KoW games and otherwise they were pretty much semi-forgotten models. When we had the large game with my friends a couple of weeks ago, they got grabbed out since they had all the right bits for a unit I needed (6 ogres, standard, musician) and so seeing they had some use, I decided to rebase them. I had originally half-considered/planned to split them out and spread them across other units and repaint them, while binning the grunts. I think the minor repaint and keeping them together is a much better aesthetic choice, and as odd as it sounds, one that respects the models a lot more. Rear view of Golfag’s. We so rarely get to see anything other than a front view of people’s painted models. Rear view of the other half of Golfag’s Ogres. 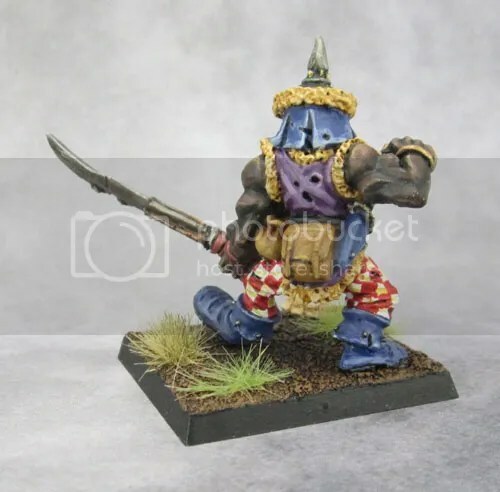 The mustard and blue and red pants got toned down further with some Army Painter soft tone wash. Purple bags and pouches got repainted brown. Green pouches and straps (all of their straps were green!) got repainted brown, with the exception of a couple of characters’ bags. Those with red furry pants had them drybrushed with browns, though I was happy to leave the deep, brown-washed red in at the darkest part of the base. The bright red fur that lined the cap of the standard got turned to a dirty white. And finally the bright red bars on the standard got repainted black. Then white. Then washed down. They just weren’t visible enough as black. I couldn’t find my little baggie of broken up GW Skeleton parts, so I ended up donating one of my new WGF skeletons to the cause, and the parts of one Skeleton (sans skull – too many skulls on GW kits) ended up scattered across the units’ bases, since I’m using bones as a basing motif across the ogre army in the same way that I’m using flowers on the Dark Elves. 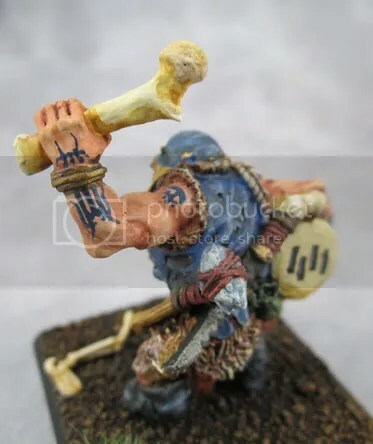 And besides, bones on the bases fit these figures especially well. I might add a couple more at some stage. 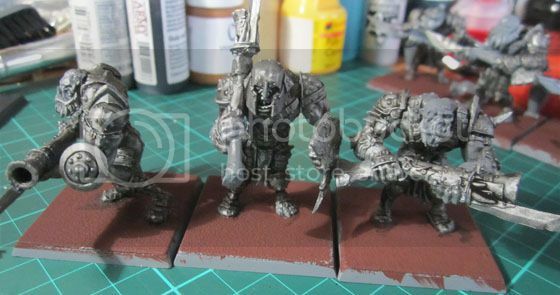 The funny thing is that after I finished rebasing them and updating them – which was pretty much so they wouldn’t look like crap anymore, found that I quite like their new look. It keeps the uniform look, the contrast between the blue and mustard still works, but the toning down of the colours and removal of green and purple (what was I thinking?) – and the new earthy bases make them look a much better looking unit. 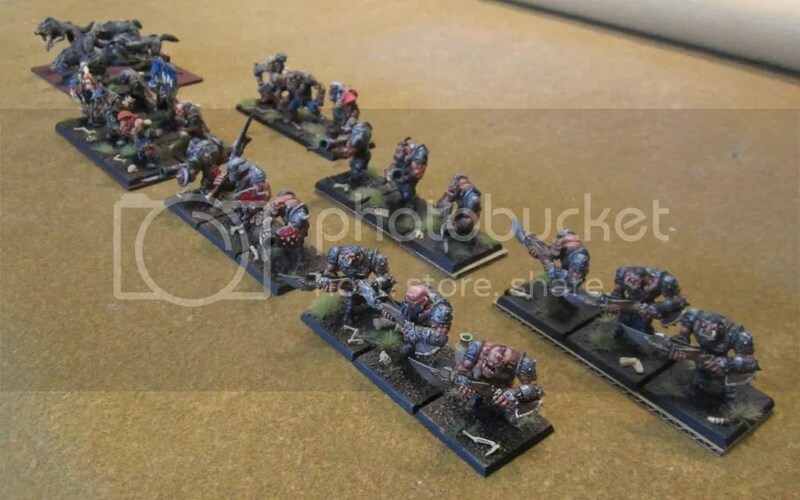 Golfag’s Ogres unit block shot – the typical formation. Figuring out where to put that standard bearer was always a bit of an issue. With 2 hero models in the unit (“Officer” and “Champion” according to SoL) as well as a standard and musician, I always had the issue of working out which was the actual unit leader. After I took the photos, put the light box away, and was putting the ogres on a shelf (and trying to figure out how to place them) I had a minor epiphany, and set them up for one last photo. 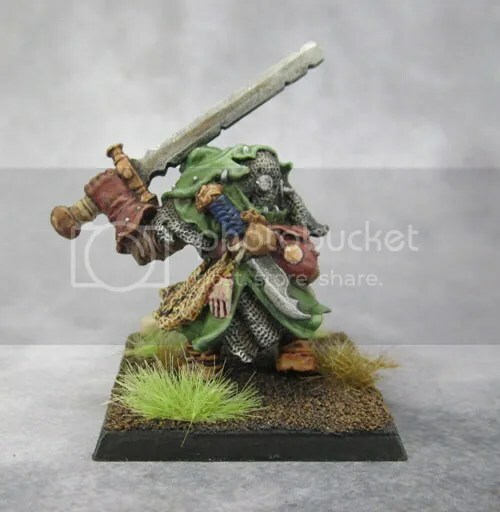 Because, you know, in KoW it doesn’t actually matter if the standard is in the front rank – and this way all of the figures get to be seen. And my favourite three get to go in the front. 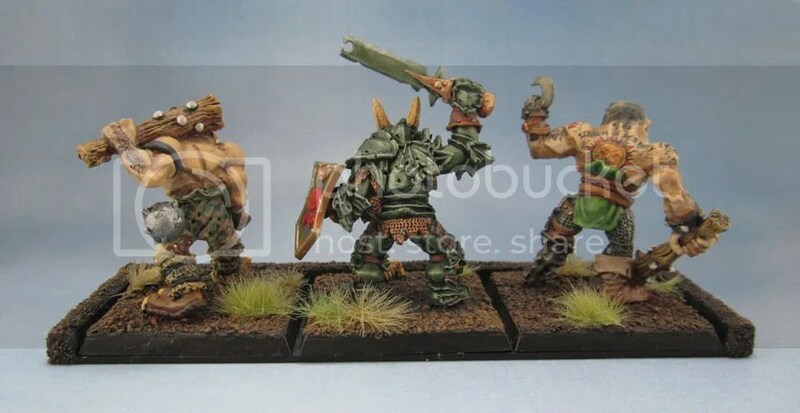 Golfag’s Ogres in their new unit formation. Looks a lot better to me! So after all that, and thanks to that one game, I’ve ended up with a unit of painted figures that I really didn’t care much about being reborn as a unit of models that I actually quite like. Even before I realised that they’re Jes’ sculpts. All that’s left now is to make a unit base for them out of plasticard. 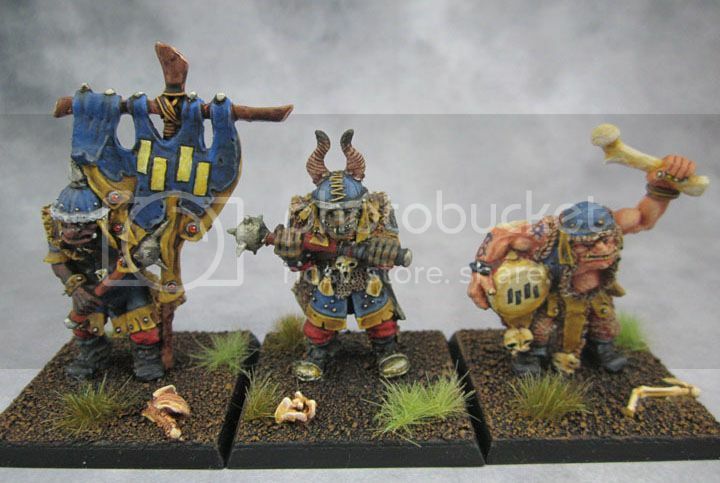 Golfag’s Ogres – All lined up! Mantic Ogre Shooters in WIP-form. Batch two. I had a form of “painter’s block” for awhile – partly because work has been incredibly full-on for the past …3? 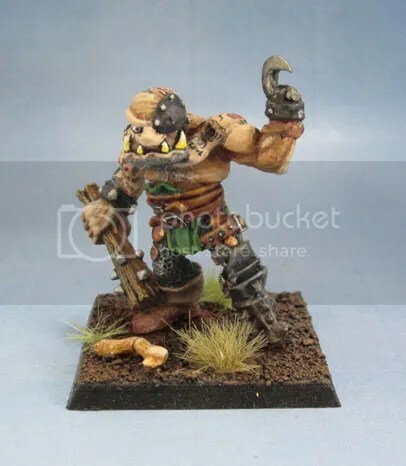 months and just increasing, and partly because painting the Mantic Ogre Shooters was such an un-fun experience that I really haven’t been incredibly keen on revisiting it. Same colour scheme and steps as last time, with the slight difference of going with muted red tabards this time. If I do a third set, I’ll either go green, blue-and-white, red-and-white, or most likely, blue-and-red. Hot water assembly and bending of parts (straightened up the central guy’s stance a little with widened feet), some GW 40mm bases and a shot of Army Painter grey. The amphora-style jugs came from some dollhouse accessory seller on eBay for a couple of dollars – they’re here to represent the magic item “Jar of the Four Winds” which in the context of Ogres is clearly going to mean some kind of magically-imbued alcoholic beverage. With some base colours and washes added, they start to take shape. You might notice that the head on the middle guy isn’t a Mantic head and is in fact an Ogre Kingdoms head – it’s one of the very smallest of those, and while slightly larger than the Mantic ones, not excessively so – especially since the Mantic Ogres are a bit disproportionate across their various body parts anyway in a Johnny Bravo kinda way. As they are now. The brass/gold trim on their weapons obviously needs to be toned down, their armour needs a slight highlight, and the skin is barely and very roughly basecoated. I’m trying a bit of an experiment on the Jars, which I’ll show in more detail once it either fails miserably or works decently. Because these sculpts rapidly become – let’s face it – boring when you need to paint a bunch of them (6 of each is already too many for my sanity) I tried to make this unit a bit distinctive and different from the first Blunderbuss troop. I did this by changing the pose of the leader, and adding a shield in his off-hand. I originally had pictured him to be holding one of the Jars of the four winds with his other hand (which is doable with some kitbashing) but then it turned out that the crossbow unit were the ones getting boozed up. So he got a shield instead. So after I’d assembled the leader, I needed to work out which head to give him. 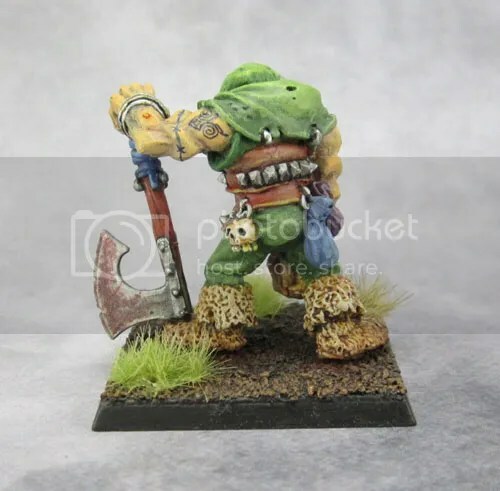 Since the GW Ogre Kingdoms head had worked okay on the crossbowman, I found another couple of heads that might work, and gave the less impressive of the two helmeted heads to this guy, saving the better one for another model down the line. It still works, and makes him a bit more imposing than his peers. After all that, and just before undercoating them, I had the idea of adding a couple of small shields to the grunts. I pictured the perfect small metal buckler that I remembered was in my bits box. It took me about 30 minutes to dig around and find it, and I wasn’t even sure if I still had it. I have no idea where it came from, but it worked just fine for the leftmost Ogre’s forearm. I then poked about until I found something suitable for the last guy, and ironically, it came from some OK bits I’d picked up off eBay almost randomly a year or two ago. Now all three had shields, and their boss, a helmet with a slightly more interesting (less boring?) pose. Obviously the brass on their weapons looks hideous right now, but as stated, it’s not finished. But let’s face it, while I want these guys to look good, they’re not going to be competition pieces – they’re going to be tabletop wargame models. 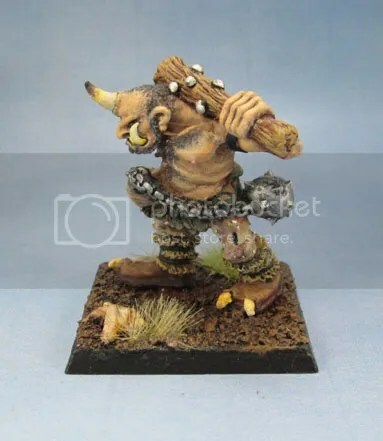 And being some of many, many pretty-much identical Mantic restic Ogre models that I have, they’re not going to get the same love, care and affection that my old individual Jes Goodwin metals do. Still, I’m basically happy with the way they’re coming along. And once they’re finished, I can start working on the fun stuff. You see, I’m holding the real cool and fun stuff hostage to finishing off these guys.